There has been a whole lot of love in my life this summer. With the engagement has come an outpouring of love and support from my family and friends. I feel incredibly lucky to have not just my fiancee in my life but also all of the people who love and support the two of us. From messages on social media, to phone calls, to tearful hugs, it’s been a truly wonderful couple of weeks. There is probably nothing I love more in life than getting together some of my very best friends and sharing a whole lot of food. Last week I got to have not one but two of these delightful dinners. So of course I had to provide dessert. 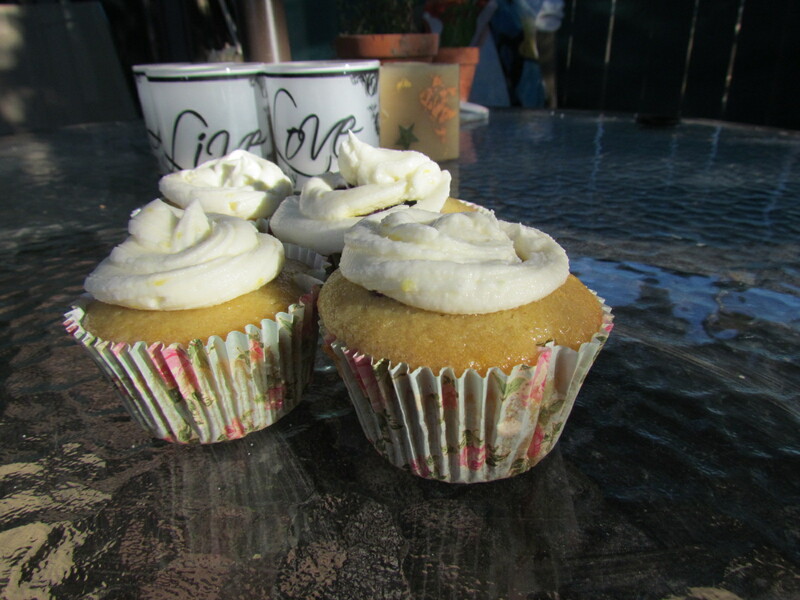 I baked a double batch of these cupcakes so I would have enough for all my friends. One of the dinners was sushi to celebrate one of my oldest and very best friend’s birthdays, the other was a barbecue in my backyard with a couple of my very best friends from university to celebrate my engagement. 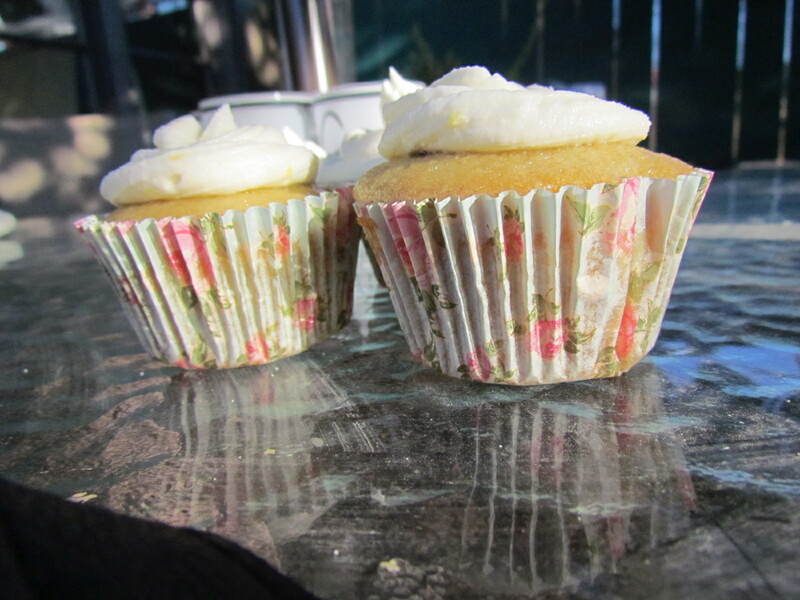 Both occasions were well suited to these delicious cupcakes. I’ll get to the cupcakes in a second, but first the friends. I have been unbelievably blessed in my life. In both highschool and university I met a group of girls who are hilarious, intelligent, thoughtful, talented and compassionate. I have stayed very close friends with both of these groups despite the many years that have passed since we were in school together. As we have all grown older we have grown together not a part. It’s a rare and wonderful thing to find people like that not once, but twice in your life. I know how lucky I am. For my highschool friends, there is a special kind of bond that is formed in the awkwardness of adolescence, we have watched each other change and grow from the frightened little teenagers to being grown women. My university friends I met at a time when I was more sure of who I was and who I wanted to be, with similar attitudes and goals we have stayed fast friends and even worked together on projects. If you guys are out there reading this, thank-you for every late night phone call, every hug, every joke, every text message, e-mail and bottle of wine. I’m so lucky to have every single one of you. Now for the cupcakes. See the dark blue peeking through the icing? I filled these babies with a homemade blueberry sauce. Because blueberries are in season and lemon and blueberry just go oh so well together. 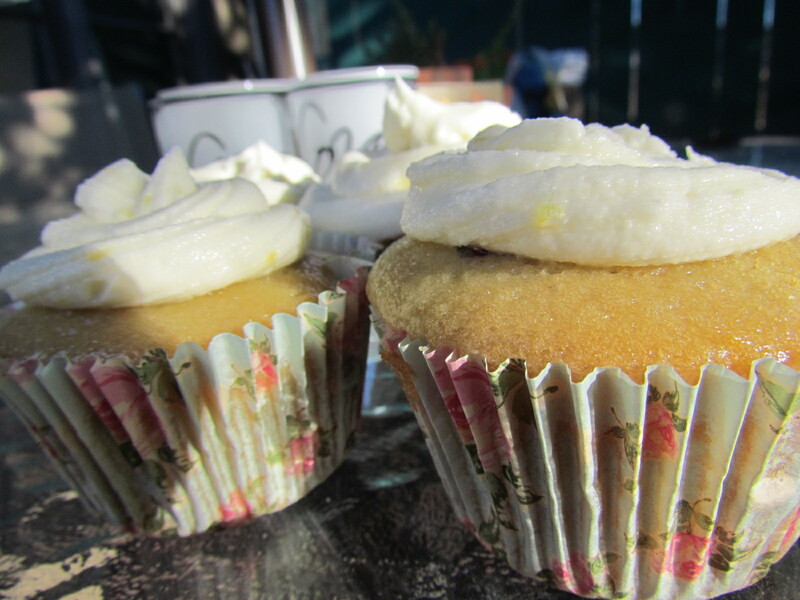 The lemon cupcake recipe is an old stand by I found on A Beautiful Mess years ago. The blueberry filling is from my newest vegan cookbook But I Could Never Go Vegan. I own way too many cookbooks, in my defence I do actually use them, they’re just so pretty and shiny! The pictures are always so enticing. Anyways back to the cupcakes. 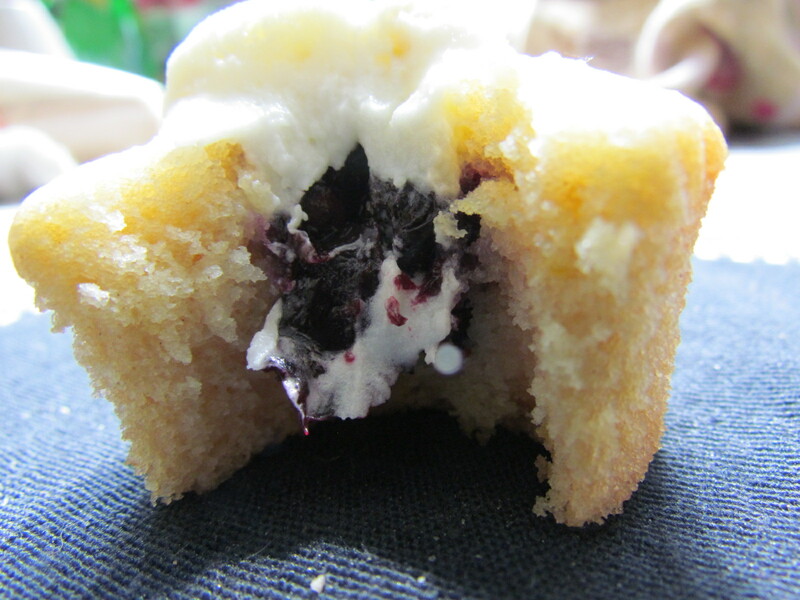 They are super simple to make, but they seem ultra decadent because of the blueberry filling. I would decorate them with fresh blueberries on top next time, but it was a bit of a rush job! Had to get them ready to go in time for dinner! 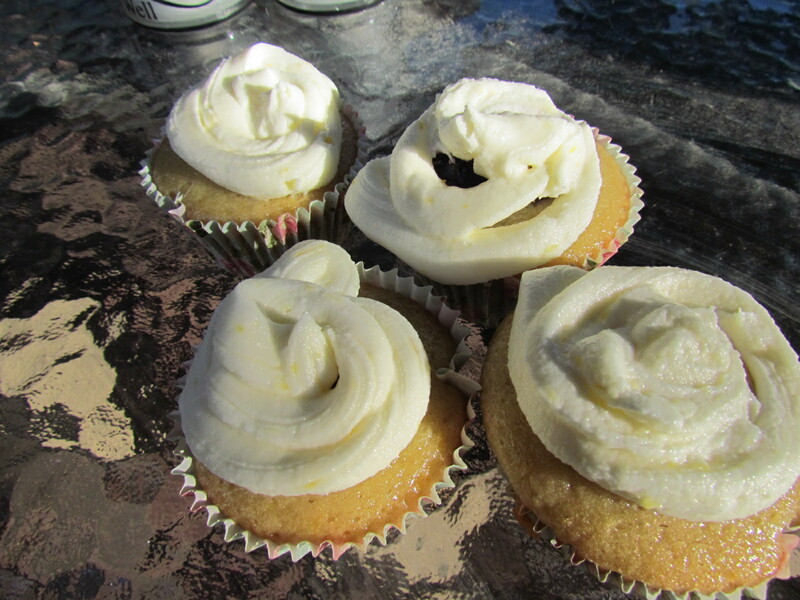 Top with buttercream and serve! < Previous Cake, A Birthday and a Surprise . . .